Senior Lyndee Spargur signed her letter of intent with Shawnee State today to play softball. Lyndee has played softball all 4 years, soccer 4 years and basketball 3 years. Lyndee also has a perfect 4.0 GPA. Pictured front row (l-r): Sam Spargur (father), Lyndee Spargur and Cammi Spargur (mother). Back row (l-r): Denise Mootz (Fairfield A.D.), Tom Purtell (volunteer softball coach), Ashley Webb (Shawnee Asst. Softball Coach) and Mark Dettwiller (Fairfield varsity head coach). 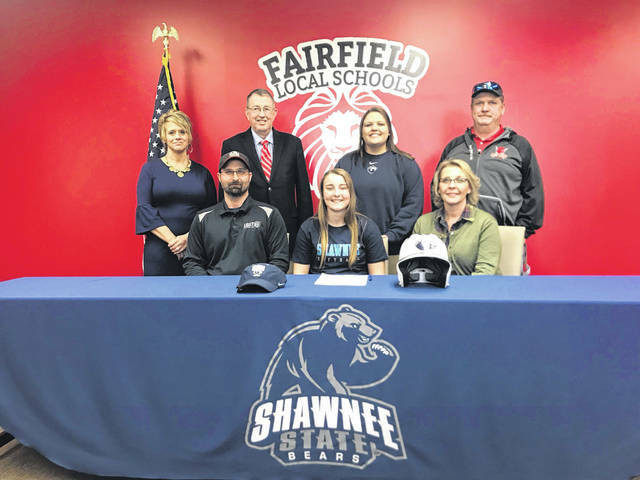 https://www.timesgazette.com/wp-content/uploads/sites/33/2019/02/web1_Spargur-Signs.jpgSenior Lyndee Spargur signed her letter of intent with Shawnee State today to play softball. Lyndee has played softball all 4 years, soccer 4 years and basketball 3 years. Lyndee also has a perfect 4.0 GPA. Pictured front row (l-r): Sam Spargur (father), Lyndee Spargur and Cammi Spargur (mother). Back row (l-r): Denise Mootz (Fairfield A.D.), Tom Purtell (volunteer softball coach), Ashley Webb (Shawnee Asst. Softball Coach) and Mark Dettwiller (Fairfield varsity head coach).